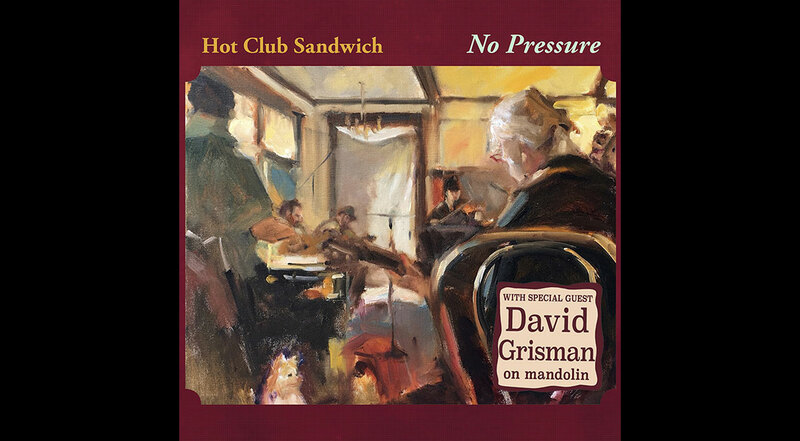 No Pressure, the fifth recording from Puget Sound string swing ensemble Hot Club Sandwich, is a special addition to the group’s catalog, featuring a guest appearance from David Grisman. The band spent a few winter days together, improvising a recording studio in an old boarding house on the Olympic Peninsula. The occasion yielded fourteen songs recorded fireside, and the room vibe resonates throughout. In addition to playing mandolin on several songs, Dawg offered creative suggestions and helped to craft the arrangements. Dawg’s composition Swang Thang leads off the record with twin mandolins on the melody. The band passes improvisations around the room, with Kevin Connor on Selmer-style guitar, Joseph Mascorella on drums, James Schneider on bass, Matt Sircely on mandolin, and Tim Wetmiller on violin. The second song and title track, No Pressure, composed by the band’s seasoned guitarist Ray Wood and his songwriting partner Vann Cantin, sets the scene for a Louisiana back-porch. Ray delivers his delicate, intentional melody on the guitar. Remarkably, after more than 65 years of musical appearances, this is Wood’s first lead vocal performance on record: ‘Got no pressure, I’m where I wanna be’. The band presents its own interpretations of jazz manouche alongside a bolero romantico, with several swing tunes at dance tempo and vocal contributions from multiple band members. Hoagy Carmichael’s Rockin’ Chair precedes a Peruvian waltz from the same era. The cover art was painted by Tracy Grisman, and she also sings the final song, a striking version of St. James Infirmary.